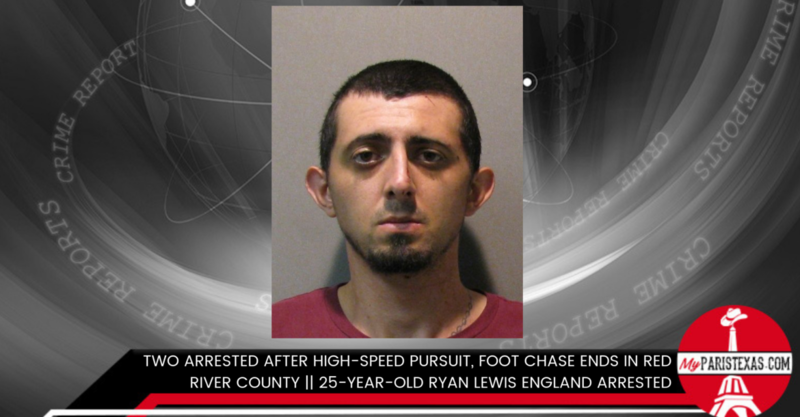 On Thursday, April 11th, Paris Police arrested 25-year-old Ryan Lewis England at 12:10 p.m. after the lengthy car chase that ended in Detroit, Texas. Another charge for credit card or debit card abuse developed as the investigation continued. Another person that was in the vehicle during the chase was arrested and charged with possession of drug paraphernalia. Around 11:29 a.m. this morning, Paris Police Officers found a reported stolen pickup from Idabel, Oklahoma on SE 12th street and attempted a traffic stop. The vehicle would not stop and a pursuit began. The vehicle then tried to lose officers by turning into a pasture on the east side of Detroit. The suspects threw many items from the car during the pursuit which were recovered by other officers. The 41-minute chase reached speeds of 95 mph in some areas. The investigation is still on-going, both suspects are just now being booked into jail and other information will be released as it’s available. The story has been updated with a name.